What is eating healthy ? Plan for success! What is eating healthy? If you are eating healthy to lose weight, let’s talk about what eating healthy is not. It is NOT about starvation or severe calorie reduction. This only serves to wreck your metabolism and cause it to slow down and thus create the yo-yo dieting effect where you lose the desired weight only to gain it right back when normal diet is introduced again. Cutting “excessive” calorie intake is a factor but eating healthy and losing weight IS more about feeding your body a healthy balance of many different kinds of food propelling a healthy active metabolism to burn calories throughout the day. Many women ask me to define “what IS eating healthy?” The answer is simple. You need a variety of food in your everyday diet in order to get all of the nutrients needed for energy and health and to feel and look good! You cannot starve yourself and have the energy needed to get active and moving. A sedentary life is not conducive to a healthy, fit life. Your body must consume adequate amounts of lean protein, complex carbohydrates, healthy fats and water so you feel like getting to the gym or playing with your kids. There are many extreme diets out there that can be harmful to our bodies that I see women and men try everyday. I am guilty as well of trying them only to discover the best way, the healthy way. For example, an all protein diet or a VERY low Carb diet are a couple out there that try to claim the answer to “What is Eating Healthy?” They are NOT the answer. Believe it or not it is NOT a “no-fat” or excessively low fat diet either. The right kinds of healthy fats are just as important in keeping with a balanced diet. Good nutrition is important for everyone. But for women, being healthy is usually defined by losing weight and seems to always be on the forefront of our minds. That’s normal but this must also be combined with being physically active to complete the package and realize all of the effects of eating healthy. So what is eating healthy? The answer is getting in the gym in tandem with a good eating plan. 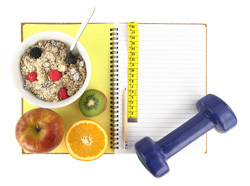 This will ensure that you maintain a healthy weight and have a strong body for long life. It is also important to realize that your eating habits will trickle down throughout your network of friends and family. As you begin to feel good and look great you will begin to answer the question “what are you doing and what is eating healthy? because people WILL ask. That’s the beauty of it! What a compliment and how good it feels when you can look great AND enjoy life while eating yummy food! I love to eat! My heritage is centered around good food and fun times! "C’est si bon” and “Laissez les bons temps rouler.” I love to eat well seasoned, flavorful meals but I DON’T like to stay in the kitchen for hours nor have to go through a 20-step process to prepare it. Why would I? I want to get outdoors and answer more questions about “what is eating healthy?” I’m healthy and fit and have the energy to get out and enjoy life not spend it behind a stove! You can do it too!